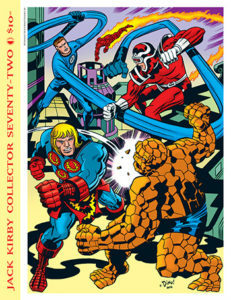 2018 Eisner Award nominations for Jack Kirby Collector and Alter Ego! Just announced: Two 2018 Eisner Award nominations for TwoMorrows Publishing! 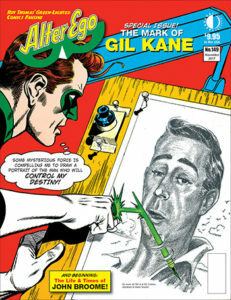 In the category of Best Comics-Related Periodical/Journalism, both JACK KIRBY COLLECTOR and ALTER EGO are nominated! The complete list of nominations is HERE! And if you’re a comics professional in any capacity, you’re eligible to vote HERE! Deadline to vote is June 15, but go ahead and get ‘er done today so you don’t forget! This entry was posted in TNT on 26 April 2018 by Mr. Morrow. 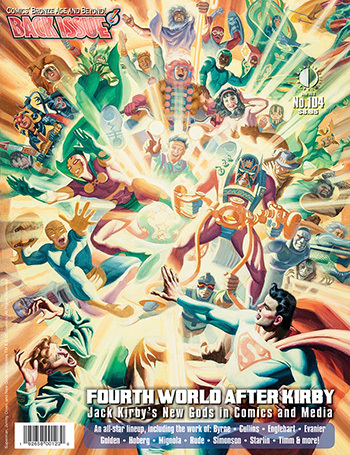 Back Issue #104 (Fourth World after Kirby) ships today! Discover the FOURTH WORLD AFTER KIRBY and the evolution of the NEW GODS in BACK ISSUE #104, shipping today! Explore the enduring legacy of JACK KIRBY’s DC characters: The Return(s) of the New Gods, Why Can’t Mister Miracle Escape Cancellation?, the Forever People, MIKE MIGNOLA’s unrealized New Gods animated movie, the Fourth World in Hollywood, and more. With an all-star lineup, including the work of JOHN BYRNE, PARIS CULLINS, J. M. DeMATTEIS, MARK EVANIER, MICHAEL GOLDEN, RICK HOBERG, WALTER SIMONSON, and more! 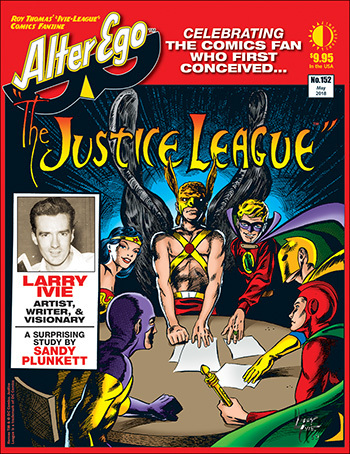 Cover by STEVE RUDE, re-presenting his variant cover for 2015’s Convergence #6. Edited by MICHAEL EURY. You can preview the issue, and order HERE! This entry was posted in TNT on 24 April 2018 by Mr. Morrow. TwoMorrows’ older Digital Editions increase by $1 on June 1 – stock up now! 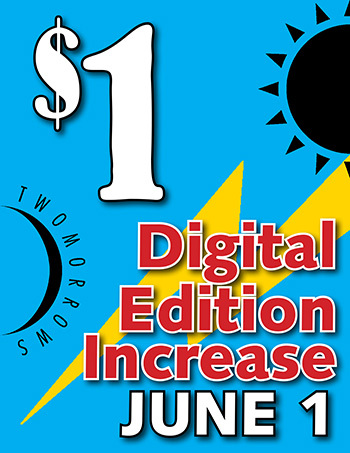 Stock up on TwoMorrows’ older digital editions before June 1, and beat the price increase! Older PDF Digital Editions (more than a year old) ordered from www.twomorrows.com increase by $1 on JUNE 1. 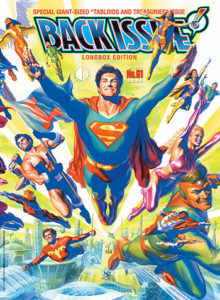 So older $3.95 digital back issues will now be $4.95, just like new issues. We wanted to give you fair warning, rather than sneak in a price increase unexpectedly. A lot of internal business concerns went into this decision, and it’s one we didn’t make lightly. After years at our current prices, this will keep them more in line with our print versions and in-app pricing (but downloading digital books and mags directly from us still costs less than app purchases, since Apple and Google don’t get a cut of our webstore sales). So if you missed any digital back issues, get ’em now and save $1 each! This entry was posted in TNT on 19 April 2018 by Mr. Morrow. 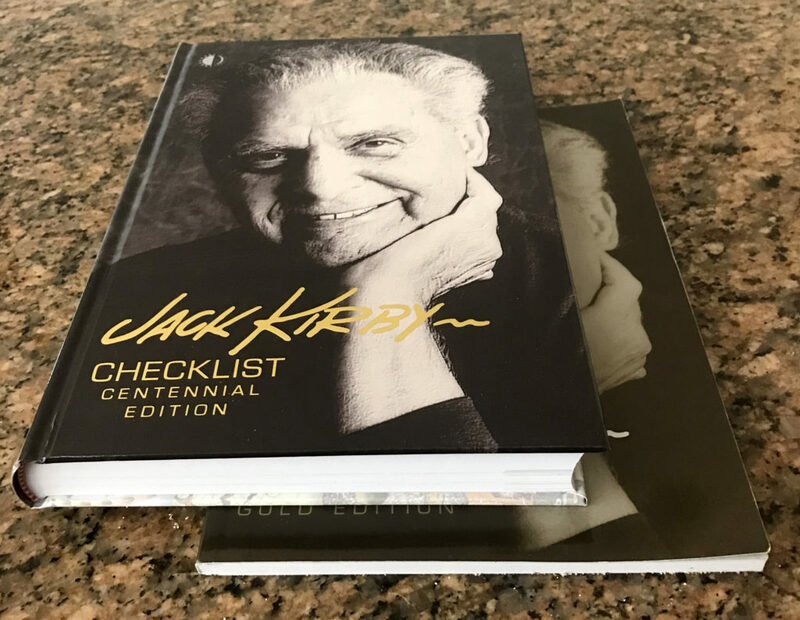 Jack Kirby Checklist: CENTENNIAL EDITION is now shipping! This is truly definitive: fully updated through Jack’s 100th birthday in August 2017, with detailed listings of all of Kirby’s published work, reprints, magazines, books, foreign editions, newspaper strips, fine art and collages, fanzines, essays, interviews, portfolios, posters, radio and TV appearances, and even Jack’s unpublished work! I am so immensely proud of this book, and of the tireless work that Richard Kolkman put into compiling, correcting, and updating all the data for the last 20+ years. Diamond snatched up most of the copies, so if you didn’t pre-order, do so now at the link above, or at your local comics shop using Diamond Order Code JAN181989. This entry was posted in TNT on 17 April 2018 by Mr. Morrow. 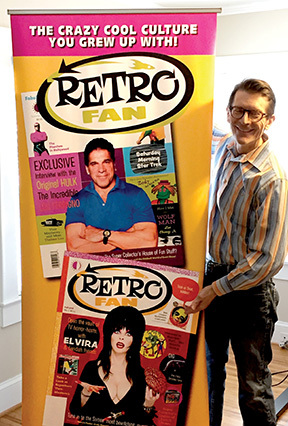 It’s a “banner” day for Back Issue editor Michael Eury, as he unpacks some of our marketing materials he’ll be using to promote TwoMorrows new pop culture magazine RetroFan, which he’s also editing! RetroFan #1 is literally going to press today, and strong orders mean a sell-out is likely once it ships in late June. To insure you get a copy, preview and pre-order it from us at http://bit.ly/RetroFan1, ask your local comic book shop to get it using Diamond Order Code MAR181967, or try your luck getting it on Barnes & Noble‘s magazine racks in July! And Michael Eury?’s first stop is at the Charlotte Comicon (at the Concord NC Convention Center) this Sunday, April 15! Go see ‘em! This entry was posted in TNT on 12 April 2018 by Mr. Morrow. Alter Ego #152 ships today, featuring LARRY IVIE, the the most important Silver Age comic book artist/writer you never heard of! He conceived (and named!) the Justice League of America—he helped develop the T.H.U.N.D.E.R. Agents—he brought EC art greats to the world of Edgar Rice Burroughs, and more. Learn about this unsung star’s career, with art by Wood, Frazetta, Crandall, Krenkel, and others. It ships today! 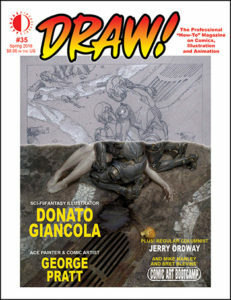 Preview the issue here. 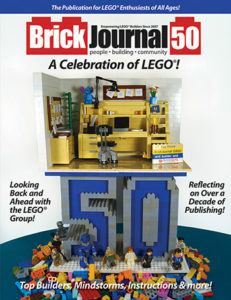 This issue will be in stores tomorrow, and already shipped to subscribers, so should arrive in the mail any time now. This entry was posted in TNT on 10 April 2018 by Mr. Morrow. New MIKE GRELL biography just announced! 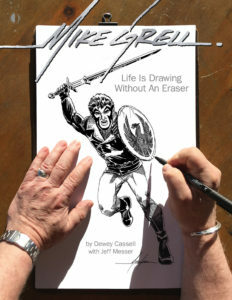 We just added our new Mike Grell biography (by Dewey Cassell, with Jeff Messer) to our website! This entry was posted in TNT on 6 April 2018 by Mr. Morrow. Preview and order it here! Preview the issue, and order it here! Or subscribe now so you don’t miss an issue! This entry was posted in TNT on 4 April 2018 by Mr. Morrow. IN PREVIEWS NOW: Back Issue #106, Comic Book Implosion, Draw #35, and more! Check out what TwoMorrows Publishing has listed in Diamond’s latest Previews catalog! To see FULL listings of all items, CLICK HERE! 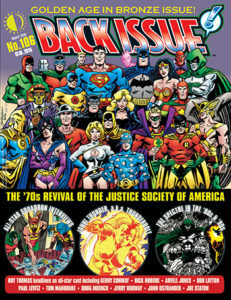 BACK ISSUE #106 – NEW! GOLDEN AGE IN BRONZE issue! 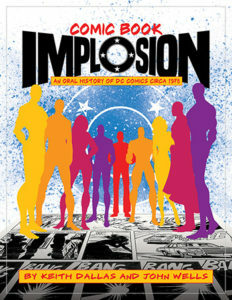 COMIC BOOK IMPLOSION (Softcover) – NEW! History of the 1978 “DC IMPLOSION”! This entry was posted in TNT on 2 April 2018 by Mr. Morrow.